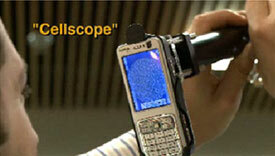 Using a Cellscope to Check for Diseases. The latest whiz-bang application for mobile users, CellScope, comes to us from researchers at the University of California, Berkeley, whose tool enables cell phone cameras to be used as fluorescent microscopes. This means that mobile devices with cameras, like the iPhone, can be adapted to collect and transmit images from blood and sputum (snot or spit) to diagnose the presence of malaria parasites and tuberculosis. While this fluorescent scope device currently requires a plug-in component, we’re not so far away from software or camera upgrades that would make this adaptation accessible to any iPhone or android device user. Similar applications could easily include the detection of E. coli or other bacteria in food. Imagine that your ground beef smells a little off. Take a snap with your cell phone, and learn if you’ve got a contaminated Big Mac. How about H1N1 (aka, Swine Flu)? Sneeze, and snap a picture; diagnosis and links to related information, services or therapeutic products could be delivered in real time. The possibilities that these types of mobile applications afford, which inform decision-making and influence behavior at the point of consumption, are endless. Are we ready for mass access and control over food quality or disease diagnostics, like the examples noted above? It won’t matter if we’re ready or not, it’s coming. I’ve written before on the demise of the PC being driven by mobile applications; this is just the latest nail in that coffin, which extends mobile’s reach well beyond where anyone could have predicted.